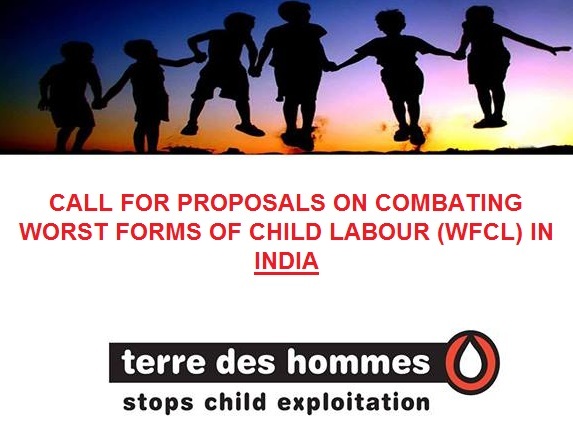 NON-FCRA PROJECT: CALL FOR PROPOSALS ON COMBATING WORST FORMS OF CHILD LABOUR (WFCL) IN INDIA! The United Nation’s Convention on the Rights of the Child (CRC) is the cornerstone of all our programmes. This Convention represents the recognition by the international community that not only do children deserve to be protected, but that they have a right to be so. These rights have been enshrined in this almost universally accepted treaty and have subsequently been incorporated in national legislation in an overwhelming majority of the world’s nations. The main theme of Terre des Hommes' work centers on the issue of child exploitation, the most serious violation of the rights of the child. Increasing numbers of children fall victim of human trafficking, sexual exploitation or hazardous forms of child labour as defined by the ILO’s 1999 Worst Forms of Child Labour Convention (ILO Convention 182). Terre des Hommes Netherlands strives to prevent child exploitation, removes children from exploitative situations and ensures that they may develop in a secure, healthy and supportive environment. The organization invests in education, training and capacity enhancement, in raising awareness among children, youth and adults and – given that poverty is one of the main factors contributing to child exploitation – Terre des Hommes Netherlands offers parents the opportunity to increase their income by providing access to savings and credit schemes. To seek justice for the victims, Terre des Hommes Netherlands encourages children and their families to report abuse and child exploitation cases, offers legal aid and social protection, trains and assists police, public prosecution offices and justice departments. Victims can also count on Terre des Hommes Netherlands and partners for assistance during police investigation and legal proceedings. To advocate and promote the rights of children, Terre des Hommes Netherlands organizes public and media campaigns to raise awareness, conducts research into the scale and nature of abuse and exploitation as well as lobbying for attention and change. The organization follows and seeks to influence policy makers on local, national and international levels to adopt, ratify, maintain and enforce legislation to prevent child exploitation and to protect victims of such practices. Terre des Hommes Netherlands always works together with local project partners. These partners are familiar with the situation ‘on the ground’ and know the best ways of reaching out and helping the children concerned. Tackling the Worst Forms of Child Labour (WFCL) is an important concentration area in Terre des Hommes Netherlands current strategic plan (2011-2015). As part of its new strategic plan (2016-2020) Terre des Hommes Netherlands plans to increase its support to comprehensive programmes addressing child labour in Asia. Approximately 41 million child labourers aged 5-14 years old live in Bangladesh, Cambodia, India, Indonesia, Myanmar and in the Philippines. More than 45% of these children are girls. Poverty is one of the main reasons for the high number of children involved in child labour in Asia as in these countries more than half a billion people live below the poverty line. There is enormous diversity within the countries; the region has varied economies and political systems that provide very different contexts for the reasons why children engaged in labour, the problems they face, their prospects for moving on from the exploitative situation, and a wide range of government as well as civil society responses and interventions available to worst form of child labour. Different studies and the learning and experience of Terre des Hommes Netherlands interventions in the countries has found working children in a number of economic sectors, including seafood processing, garment and footwear factories, mining and quarrying, pyrotechnics, rag-picking and scavenging, rubber and sugar-cane plantations, entertainment, cultivation of agriculture and other services. Worst forms of child labour in the countries includes child domestic work (CDW), bonded child labour, hazardous child labour, trafficking, commercial sexual exploitation, and the recruitment and use of children for armed conflict or drug trafficking.This list is not exclusive but it gives an indication of the efforts being made to document the many and varied forms of child labour. In the Indian context, this call for proposal aims to address the issues of child domestic work (CDW), girls/ young women in textiles & garments industry and children in mining sector. Although there has been progress in reducing child labour in the countries, the achievement is fragile in some cases and must be monitored and strengthened to ensure sustainability. A high tolerance for child labour in the countries exacerbates the problem and hinders the implementation of action against it. In addition, a large number of children in areas affected by natural disasters and climate change are vulnerable to entering into child labour. Over the years, countries have made significant advancement in terms of law and regulatory framework against child labour. At the sub regional level also; concerted efforts have been undertaken to promote child welfare and combat the trafficking of children. SAARC (South Asian Association for Regional Cooperation) member States signed the SAARC Convention on Preventing and Combating the Trafficking in Women and Children for Prostitution SAARC Convention on Regional Arrangements for the Promotion of Child Welfare in South Asia. The signing of these two Conventions is seen as a milestone on the path to facilitate and help in the development and protection of the full potential of the south Asian child, promote understanding and awareness of the rights, duties and responsibilities of the children and others, and to set up appropriate regional arrangements to assist the member States in fulfilling the rights of the child, taking into account the changing needs of the child. ASEAN Labour Ministers’ Work Programme, 2010-2015has planned the development of regional guidelines with respect to eliminating the worst forms of child labour based on appropriate studies. This Call for Proposals aims to protect children from the worst forms of child labour in Asia. Each programme proposal should consist of at least 3 local NGOs (organisations originated in the country of implementation), local networks or other local non-traditional development partners e.g. research institutes. Terre des Hommes Netherlands has a preference to fund local NGOs, however doesn’t exclude international organisations or stakeholders, but they cannot apply as the lead applicant. Co-applicant(s) participate in designing and implementing the programme. Coherent programmatic approach Terre des Hommes Netherlands will fund programmes on worst forms of child labour based on the theory of change with related outputs (Annex 2). Applicants and co-applicants should demonstrate a successful track record in addressing child labour. While the proposed programme should focus on at least three of the four strategies (prevention, promotion, provision and prosecution), all proposed programme plans should include the cross cutting strategy: participation of children and child rights based approach (CRBP). 1. Prevention: Strategies should target children vulnerable to (worst forms of) child labour by addressing the root causes such as poverty and lack of education. Activities can include (non-formal) education, TVET, socio-economic development for vulnerable families, social mobilisation, awareness raising campaigns, education and training of the general public, vulnerable groups and government officials, cooperation with the private sector, particularly when it comes to worst forms of child labour. Sustainability of the preventive measures is deemed to be built-in through involvement of community and establishing referral, linkage with local resources. 2. Provision: Immediate support services for child labourers could include medical and psychological care, shelter and legal assistance while longer term services could include a return to the family or community, reintegration into school or income-generating opportunities. Feasible economic opportunities for children victim of labour exploitation or support to their families through e.g. social enterprises. Corporate Social Responsibility (CSR) is expected to be promoted for support provision of the child labours. 3. Promotion: Activities could include addressing the adoption/revision/implementation of National Plans of Action (NPAs) on child labour. This could include developing an advocacy strategy on child labour both for national government as well as regional bodies such as ASEAN and SAARC. This could include following-up ASEAN Labour Ministers’ Work Programme, 2010-2015 and undertake active lobby toward implementation of the Ministers’ commitments. For SAARC, advocacy and lobbying to facilitate achievement of SAIEVAC key results and indicators on child labour. The approach of advocacy and lobby is envisaged to be evidence based, thus research and knowledge management would be an integral part of the programme. Working with media houses, media stars, other public media and influential businesses, to advocate against (worst forms of) child labour, to warn for the dangers of worst forms of child labour and to put influence on governments, traditional and local leaders and the public opinion towards protection of children against child labour and instead create safe (commercial) alternatives, should be included. 4. Prosecution: Strengthening the judicial and prosecution system through raising awareness, capacity building and extended support (supplementing/complementing services) to the law enforcement/judicial authorities. Facilitating enabling environment for children to seek legal aid and also provide legal support to the victims of child labour exploitation. Terre des Hommes Netherlands believes that cultural practices and traditions should not be a reason to violate child rights and condone abuse and exploitation. Proposed programme on child labour should also seek to address cultural practices and traditions, particularly in relation to gender. The initial planned duration of a programme should be 36 months, starting on 1 January 2016. Programme proposals that do not follow the above mentioned requirements and that do not use the prescribed forms are automatically disqualified. Depending on the programme design, budget range from: EUR 500,000 to EUR 750,000 for India.The proposed programme budget should be at least 85% programme cost and not exceed 15% management cost.